Elevate your correspondence to the level of art with these luxe note cards. Handcrafted of artisanal papers and lined in a second layer of blank white. Fully patterned on both sides. These thick cards feel nice and substantial in the hand. Set of 4 cards. 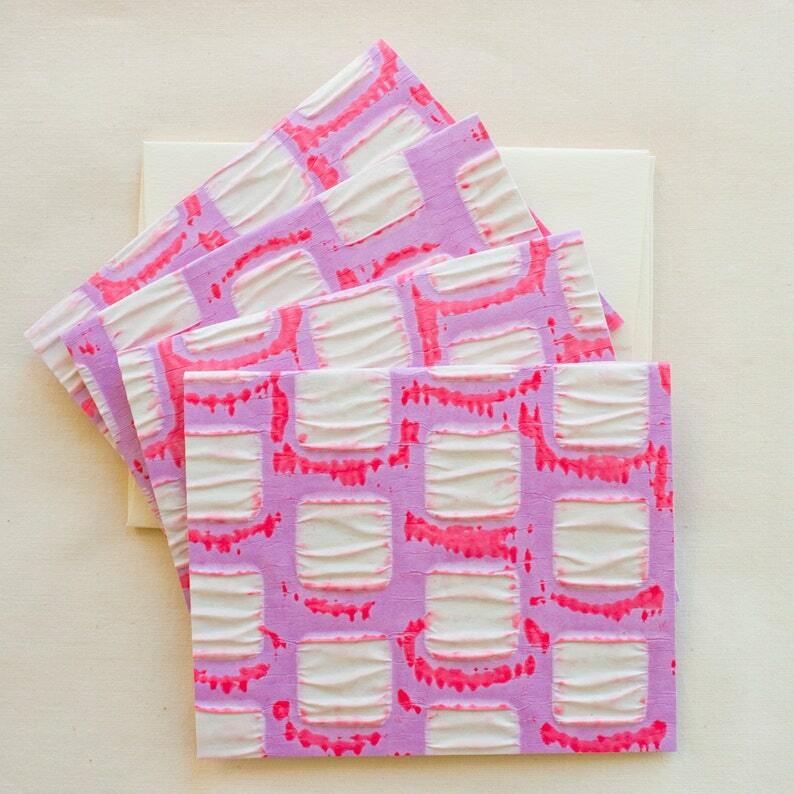 Choose blush pink or 100% recycled cream envelopes with a deckle edged flap. A2 Envelope: 5-3/4" x 4-3/8"
This bag is so cute, it even shipped quickly and got to me before I expected it! You may cancel your order as long as it has not yet been shipped. I want you to be completely satisfied with your purchase. THERE IS NO RETURN ON VINTAGE ITEMS, so please read descriptions carefully. FOR NEW ITEMS: Please return unworn/unused merchandise in new condition within 7 days of receipt. I am not obligated to honor returns or exchanges after this point. When you buy from independent artisans, not only do you get high quality, long-lasting treasures that have been carefully and lovingly crafted for you in happy little workshops--you’re also supporting artists like me in living our dreams. Like my grandmother before me I've been designing a career that lets me stay close to home, creating out of my office and atelier. I have a background in graphic/marketing design, but there's nothing quite like the tactile beauty of hand-held, usable objects. If you're looking for anything in particular or would like something similar to what you see, just let me know. I look forward to hearing from you. Enjoy your time on Etsy!